On the surface, the Mio Motiva Petite heart rate monitor watch--which offers a band designed specifically for petite wrists--is a stylish, everyday, wearable fitness accessory. But the Motiva Petite takes things one step further by integrating Mio's patented weight-management system, giving you all the motivation you need to reach your health and fitness goals. Your weight is directly connected to the foods you eat and the exercise you get. The Motiva Petite helps you manage the former by setting daily calorie targets and recording the number of calories you eat throughout the day. The Motiva Petite then tells you how well you're doing and sets off an alarm should you go over. When it comes to exercise, the device monitors your heart rate and makes sure it stays high during workouts for a maximum calorie burn. With the Motiva Petite, you can literally watch the calories burn off. 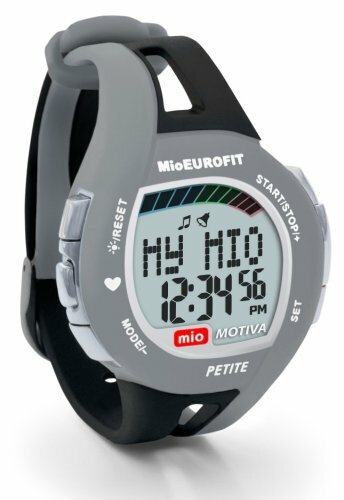 Specific features include the ability to accurately read your ECG heart rate without a chest strap, five exercise timers (count up, count down, count up with warmup, walk/run, and repeat), Mio's 3,500 Calorie Countdown program, and a user-accessible battery hatch. As a bonus, the Motiva comes with an interchangeable watch band in sky blue and orange, along with the MioSense Guide for Healthy Living, a booklet that includes information on health, nutrition, diet, fitness, and exercise, along with carb and calorie tables at the back for easy reference. The story of Mio began in 1999 when it was created by entrepreneur and mother of three, Liz Dickinson. Like many of us, Liz balances family and career, leaving little time for fitness. After several unsuccessful attempts to achieve her fitness goals and shed the pregnancy weight-gain of her third child, Liz turned to a personal trainer for advice. While working with a trainer, Liz realized the key to getting in shape and staying in shape is to practice smart eating habits, monitoring calorie intake, and using a heart rate monitor to ensure that she exercises at the right level. Liz realized there wasn't a product available on the market that would easily help her follow her trainer's advice. Liz didn't have time to read labels and carry a calorie journal in her purse, nor did she have much patience for the uncomfortable chest strap she had to wear to get her heart rate. She knew there had to be a better way, so Liz used her technology and marketing savvy to create Mio, the world's first heart rate monitor to work without a chest strap. And, it didn't stop with just heart rate, as Mio also has a patented calorie management system that offers a straightforward approach to managing your diet. With the help of Mio and a balanced diet, Liz was able to shed those unwanted pounds and gain the benefits that come with improved fitness: more energy, more vitality, and less stress, and help many others do the same with the creation of Mio's products. This is my first heart rate monitor. I debated between the one with and without the calorie counters and got this one. I find it generally intuitive to use with one review of the directions. For me the only notable issue has been the inability to take a reading while exercising. Much motion affects the ability to read, so you have to be pretty still while you do. This is an issue because the calorie burner uses your heart rate to calculate calories burned in the workout. This is fine for my DVD exercises since there are some breaks that I can measure my heart rate, but for jogging, for example, I had to stop jogging and walk slowly to get a reading. I would not recommend this watch if you want to check your heart rate during exercise without slowing WAY down or stopping. The reading is quick, maybe 6-8 seconds, so you don't have to stop for long. Having to push the bottons for me is not really an issue, I don't mind a small wait. Having to be pretty still is the issue. I like the net calorie counter. You enter the calories you eat each time, which is easy to do. It calculates how many you burned during exercise and adding the two displays a net calorie intake for the day. This is very helpful if you are trying to manage calories. There is a very small book with directions and a calorie table that is helpful with estimation. Ironman I would use the timer for all kinds of other things than exercise, but with this timer tied to calories burned, I can't do that. I miss that feature. There is an alarm that would have to be used instead, but alarms need more set up to use and is therefore less desirable. The watch is fairly tall off the wrist, but the band does fit a small wrist fine. Changing between the two watch bands is easy, but I wish the other color was not such a bright orange which has more limited use than some other color would. I agree with the comment that the beep is very quiet. If you need to rely on a beep during your exercise, it would not work well. You need to look at the watch to check the status. I owned Polar F11 with the coded chest strap. I bought this watch because I want to use it for my lap swim (I'm not about to dip my $150 watch to the pool). I test the watch heart rate monitor accuracy during my morning walk by wearing my polar on the other hand. (I know it's overkill, but I need to know if the heart rate monitor is accurate). I took 7 reading from the watch, and 5 of them were accurate. They showed my heart rate the same number as my polar watch. If it's off, it would be off by 2-4 beats on the lower side than my Polar. Part of it maybe because my Polar reads my heart rate continuously while my Motiva reads my heart rate at a given moment and it takes time to read it too. The other 2 off reading might be caused by the way I pressed the sensor (I might not pressed it correctly) since it's a little challenging trying to get your heart rate while you are moving and using your left hand (I'm right handed). On my next walking exercise, I did another test. I took 3 readings and all 3 reading read the same heart rate as my Polar. So overall, I would say the motive watch is accurate enough. As far as design and construction, I think the watch is stylish enough to wear for daily time keeper, and the watch looks really sturdy and well made. It's also small enough for women to wear. The only complaint I have is the alert sound (whether is for the exercise timer, alarm or anything that needs alert). The alert sound is way too soft. I barely can hear it. Even, my rebook watch has a louder sound than it. I can even hear my rebook watch alert while swimming and listening to my waterproof MP3. Compare to my Polar, I can set up the alert sound to: loud, soft or silent. With my Motiva, I have to keep checking the watch all the time to see if I have reach my exercise time. I really like this heart rate monitor for its strapless feature. I have an old Acumen Eon Basix Plus before. After 2 years of continuous use, the transmitter strap became irritating to my skin even though I took care to clean it after every use. And the calorie counting feature is wonderful. The performance bars make it easy to tell how you are doing. It makes calorie so much easier than carrying a little notebook around. When my daily calorie get up to the "red" zone, I know it is time to add some exercise to get it in the "green" zone.